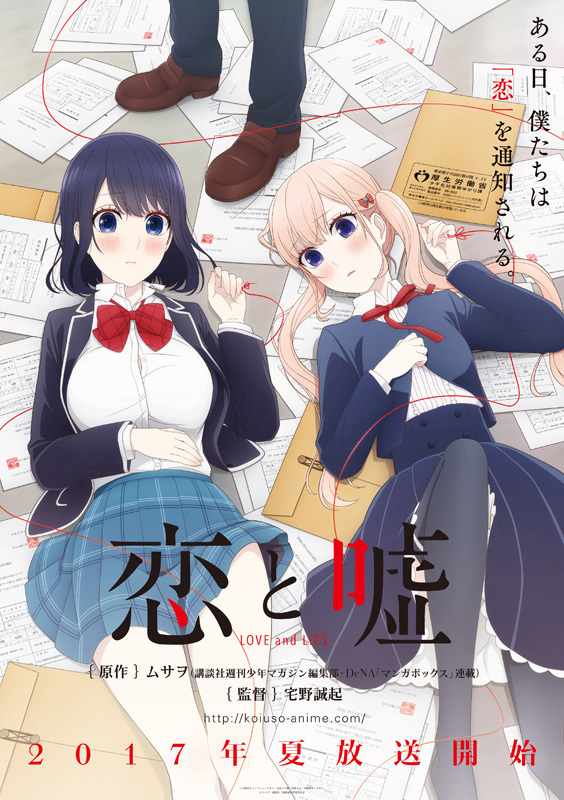 This year's 12th issue of Kodansha's Weekly Shonen Magazine is reporting on Wednesday that Koi to Uso (Love and Lies) manga will be adapted into a television anime this summer. Seiki Takuno will direct the anime, working again with LIDEN FILMS. Musawo launched the manga in DeNA's MangaBox app in both English and Japanese in August 2014. The story follows Yukari Nejima, a fifteen schoolboy, who lives in a world where lies and love are forbidden. In the near future, when people in Japan turn sixteen, they are assigned a marriage partner by the government base on compatibility calculation. But, Yukari has been in love with someone that is not his arranged partner, what will happen? "One day, we were informed of 'love'," is the tagline for the anime.